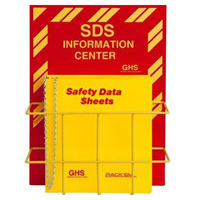 Title: 11/13/1998 - Format for Material Safety Data Sheets (MSDSs). This is in response to a memorandum forwarded from your office to the Occupational Safety and Health Administration (OSHA). This memorandum was written by Mr. Russell Calcagno, III, Facilities Management Analyst, Monroe County, regarding the need for a uniform format for Material Safety Data Sheets (MSDSs). In the OSHA Instruction, Inspection Procedures for the Hazard Communication Standard, CPL 2-2.38D, which became effective on March 20, 1998, OSHA recommended the use of the American National Standards Institute (ANSI) Z400.1-1993 for the preparation of MSDSs. However, OSHA cannot mandate one format for MSDSs as the Hazard Communication Standard (HCS), 29 CFR 1910.1200, is a performance-oriented standard. This means that OSHA has set the framework for information transmittal but that manufacturers, importers, and distributors are allowed to determine the format in which this information will be provided. While MSDSs are an invaluable resource for hazard information, they are only one facet of hazard communication in the workplace. Labels, a written program, and training are also required by the HCS to ensure that employees have the tools they need to work safely with hazardous chemicals. An effective hazard communication program would use all of these facets to ensure that employees know how to handle chemicals appropriately, including in emergency situations such as the one referenced in Mr. Calcagno's memorandum. Be OSHA-compliant with HazCom signs, posters, labels, centers and more from Safety Emporium. You should also be aware that there is an extensive international effort underway to develop a globally harmonized system for hazard communication, including a uniform format for MSDSs. The United States is an active participant in this process, which should lead to an agreed-upon global format. We trust that this adequately answers Mr. Calcagno's concerns. If further information is required, please feel free to contact OSHA's Office of Health Compliance Assistance on 202-219-8036.